Sandy Dancy - Alexander (and possibly Isaac Alexander) Dancy, son of Isaac and Mary Lamb Dancy. 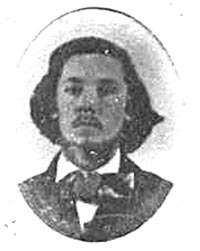 Brother of John Henry Dancy. Born at Dancyville, Tennessee, 1837. Died at the Battle of Perryville, KY., 1862. This photo, a tintype, about 1-1/4 inches square, was mounted in a tiny oval brass frame, attached to a card. much the image was barely distingusable. Using a photo editor has at least made the image viewable. brother of Isaac Bradley Dancy. Born at Dancyville, TN., about 1865 died in Texas about 1926. He was referred to often, as Sandy, in his mother's diary.